About : Random Photoshop tricks, texture orientated. This tutorial will explain a number of random Photoshop tricks that can be handy for texture creation. The tutorial does not aim to explain how to create a texture from start to end. It only covers techniques that aren’t hugely well known as I didn’t wanted to write yet another tutorial on the same old subjects again. I personally use all of these techniques regularly to help me create textures. A lot of these tricks are very simple, but handy. I use Photoshop 7, so some pictures may be slightly outdated. It will work for any version though. This is a very simple technique that can be achieved in various ways. I personally simply create a layer, fill it with a color, and put it to Overlay, but you could just as well use the Layer Style, or the Image Adjustments menu. I always blend a color layer on top of a texture to make its colors more consistent. Simply create a new layer, and fill it with any color. Put the layer to Overlay, and then open Image – Adjustments – Hue and Saturation and tweak the color of your newly created overlay until you have the desired result. 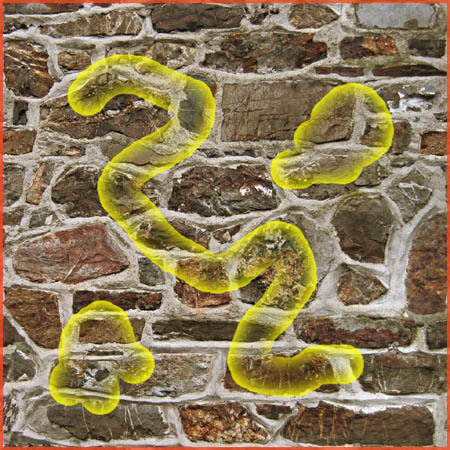 The right part of the image has a yellow overlay. This works great to give the entire texture the same kind of color, and to make sure that all textures in the package, have a similar color. It may also a good idea to apply a subtle (low contrast) cloud filter to the overlay, to add additional but very subtle variation. If you have to do this for many different textures, it may be quicker to create a style for the color, and simply keep on reapplying the style. Using the Color Range selection tool, and then darkening those pixels, works well to add some variation to otherwise monotone textures. 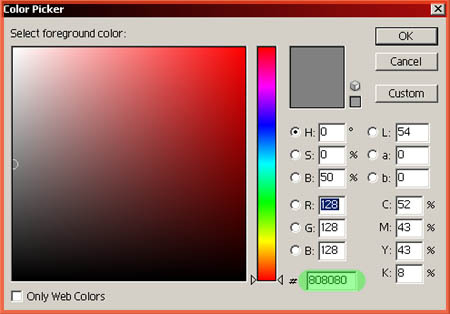 Use the Color Range tool from the Select menu, and select something with it. It usually works best if you make it select only the darker pixels. Don’t Fuzziness too high. I usually keep it below 60-70. Ok it if you are happy with the selection. 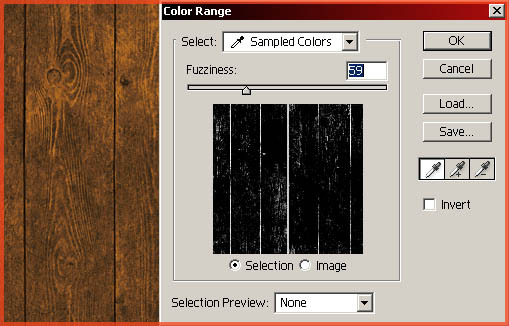 Next, either use the Image – Adjustments – Hue and Saturation tool, or add a new Adjustment Layer. Using an Adjustment Layer usually gives you more control and should be preferred.At the bottom of the layer window, click the New Fill/Adjustment Layer button. 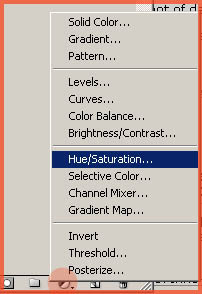 The Hue and Saturation layer will take over your selection, and only be active for those areas that you had select.Open it up, and drag down the brightness and saturation a lot. The right side has variation applied achieved with Color Range. If the result looks too pixilated, it usually helps blurring the Mask map from the Hue and Saturation Layer slightly, using the result Gaussian Blur filter. Here is another quick example. I selected the bright pixels this time, lowered their brightness a little, raised the contrast a little using Levels, and then used the same selection to add a color layer on top, like explained in the first item, and added more color variation that way. Finally I also added a general color layer on top, covering the whole thing. I went from the left texture to the right one in about 30 seconds. Messing with the bright pixels can be tricky as it might look bad when you try to lower the brightness of bright pixels. Blurring the selection a bit may help for that. This technique has been around for a while, but it can be really handy. It has been explained before, but it doesn’t hurt covering it again. 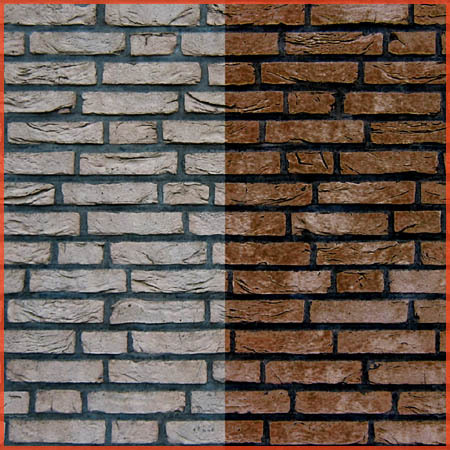 If you have a texture that is too affected by lighting to get it to tile properly, like following texture. 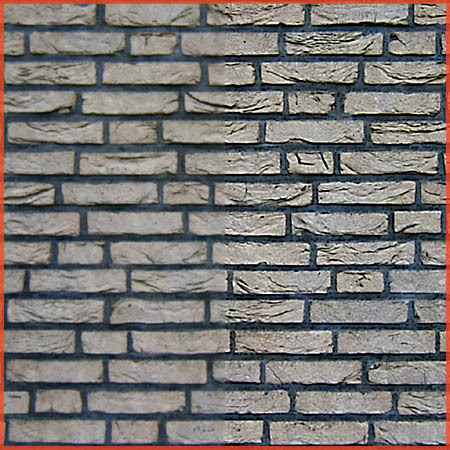 The texture was offsetted by 50 percent, and the tiling issue is very obvious. The bottom half of the texture was considerably darker than the top, making it hard to turn into something tillable. 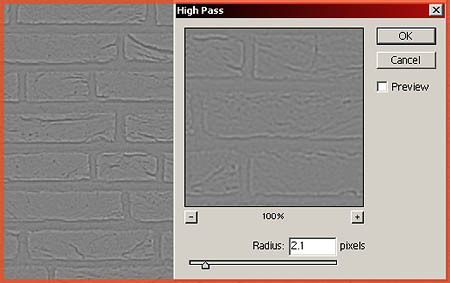 Run the High Pass filter on the texture, found in Filters – Other. Set the number as high as possible. Make sure that the difference in brightness has more or less disappeared. In my case I had to go for a pretty low value of 15.8 before the difference kind of disappeared. It does not has to disappear entirely, just almost. You can remove the remaining difference manually later. Next, right after you applied the High Pass, go to Image – Fade, and set it to Luminosity and possibly downscale Opacity a little. Done! 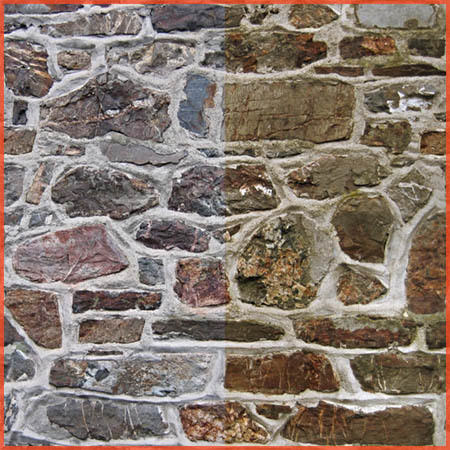 The texture may have become brighter or more washed out in the process, you can easily adjust that later on again through the Adjustment options. 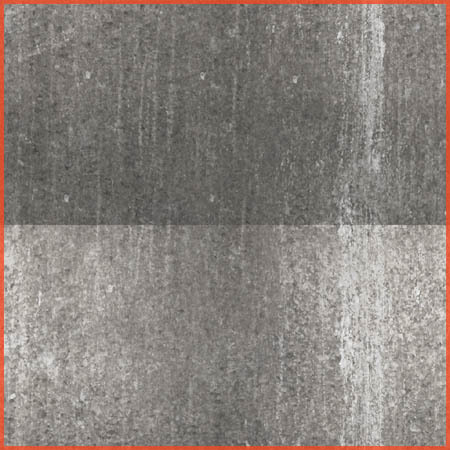 If that technique doesn’t cut it for you, you could also very simply add a white-to-nothing or black-to-nothing gradient on top of the texture that only covers half the texture, and make it counter the difference in brightness. So if the top of the texture is considerable brighter than the bottom, you can apply a black-to-nothing gradient from the top down to the middle in a new layer, and set the layer to Darken, Overlay, Multiply or whatever works, and downscale the Opacity until it more or less counters the overbrightness of the texture entirely. A combination of these two methods might work even better. Sharpening a blurry image with the default Sharpen filter usually doesn’t work too well. The Sharpen filter adds ugly artifacts to the image if used too much, and it usually sharpens the pixels/small details, but the not the larger and more important shapes. I always sharpen images by duplicating them, running a subtle High Pass filter on them, desaturating them, and setting the layer to Vivid Light. 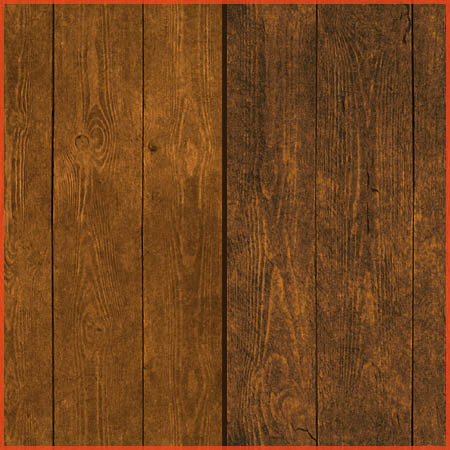 Duplicate your texture into a new layer. If your texture is made up of several layers, do a flattened copy by doing CTRL+A (Select all), and CTRL+SHIFT+C (Copy all layers – flattened copy). Paste it back above all other layers, or at the very least above your base texture layer. On the copy, run Filter – Other – High Pass. Use a low value! 2.0 or similar should do just fine. 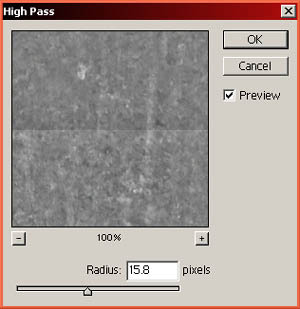 Next, desaturate the result using the regular Desature tool in Image – Adjustments. Finally, set the layer to Vivid Light. Possibly downscale the Opacity. If it still isn’t sharp enough, simply duplicate the layer another few times. I often add Layer Styles on separate layers, using Vivid Light to mask out the layer itself, and only make the Layer Styles visible. This is quite simple to achieve. Simply create a new layer, and fill it with perfect gray, code 808080. Set the layer to Vivid Light. As you will notice it will simply disappear. Next doubleclick the layer to open its Layer Styles, and just do whatever you want to do with it! In my example I set an Outer Glow to the layer, and I erased some areas from my layer using the Eraser. You could also do it the other way and simply paint with perfect gray on an empty layer. I use this often to add a dark edge around things, or to pattern overlay specific areas easily. The best thing about Layer Styles also is that you can copy a layer style from one layer to another, so this enables you to make a configuration with the correct Pattern Overlay and Color Overlay and possibly a Glow/Bevel, and just copy over all those settings to another Gray layer on another image in no time. If you really need to use that one single image or texture but unfortunately it has a terrible JPG compression, and lots of artifacts around, it can help to add a blurred color layer on top. It won’t make it the most awesome texture ever, but it will help. The technique can also be used for concept and matte paintings and all that. Duplicate the image into a new layer above the original layer, and blur it considerable using Filter – Blur – Gaussian Blur. Blur it considerable, like a value over 6.0. Next, set the layer to Color. That’s it. It may not work on an image that has a billion tiny little details, but for most textures it does fine.